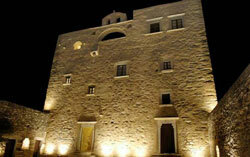 The municipality of Drymalia on Naxos, as well as the Cultural Organization «AION», in cooperation with the Benaki Museum of Athens, are realizing the Naxos Festival, held in the Bazeos Tower quarters, a restored 17th century architectural monument, in the inland part of Naxos, 12 km from Hora on the road to Halki (tel. 22850 31402). For 2008, Naxos Festival has chosen as thematic axis of its program the relation between art and madness. For more than a century, the wide public has been “familiarizing” itself with this cultural bond, relation through theatrical texts, cinematographic work - but also through developing artistic perception of figurative creations, that acquire aesthetic autonomy. We encourage, as much as possible, a more thorough search of the relation between art and madness in all forms of creation, far from mythologies, easy correlations and simplistic excesses. We will refer to authors and their work, to movements and artistic currents which were based on this relation and that considerably influenced the perceptions and the aesthetics of Modern Art. Figurative exhibition of art brut work, selected from Greek National Gallery, Greek and French centres of mental health, and private collections. The aim of the exhibition is to present the art of social groups with mental problems, as it is nowadays recognized and expressed on an equal basis within the open structure of our postmodern society. In the 20th century, terms as art brut, outsider art, marginal art, etc., used to characterize artistic work that was not included in the official corpus of rationally defined artistic creation. A view that was, and still is being reconsidered, thanks to the contemporary perception of art, as well as by the current trade practices in the art market.